Internet Privacy Rules In Part Face A Halt At The FCC : The Two-Way The new telecom chief is moving to halt one part of the sweeping rules for Internet service providers, which were passed last year in part based on "net neutrality" regulations. 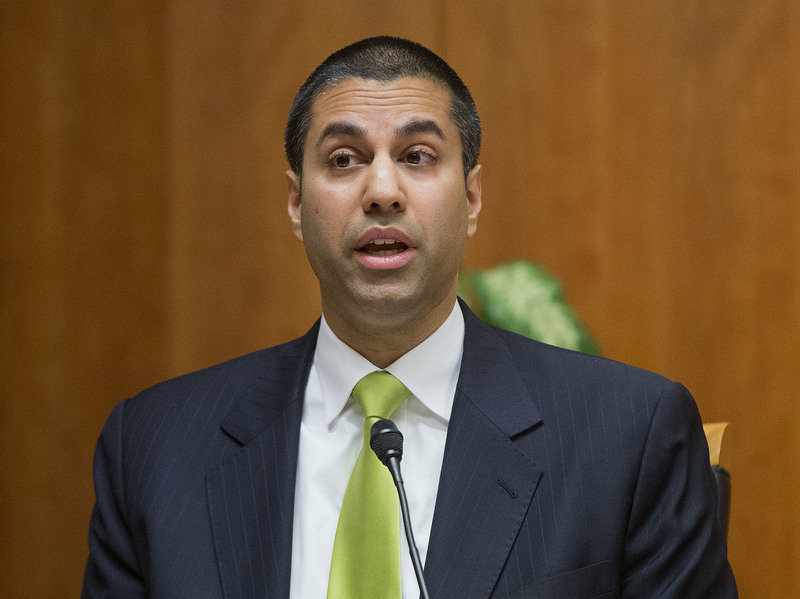 Federal Communications Commission Chairman Ajit is moving to soften his predecessor's sweeping privacy rules for Internet service providers. Overall, the privacy rules would regulate how ISPs have to disclose to their customers what information is collected on them and how it's used or shared with other companies — including guidance on getting consumers' consent in some cases. Pai's move on Friday does not target those data-collection regulations, but goes after one element of the rules related to security protocols and other measures ISPs have to take to protect the collected data. While the rest of the FCC's privacy regulations are still winding through required government reviews, the data security rules were set to go into effect on March 2. "This is the first robin of spring," says Andrew Jay Schwartzman, veteran telecom lawyer now at the Georgetown University Law Center. "These rules are about to go into effect so (Pai) has got to act on them now. ... He's got more time to act on the other rules." A group of telecom associations and companies, including Comcast, Verizon, AT&T and T-Mobile, has filed a petition asking the FCC to halt broader privacy rules, which were passed in part on the basis of the broader authority the agency claimed over the industry through its landmark "net neutrality" overhaul. As we've reported before, telecom and cable companies argue that the new FCC privacy rules put them on an unequal footing with other Internet companies that collect data on users, like Google and Netflix, which are only overseen by the Federal Trade Commission. The FTC's privacy guidelines are less stringent than the ones passed by the FCC and they are implemented through investigations and enforcement, rather than pre-emptive regulations. "Chairman Pai believes that the best way to protect the online privacy of American consumers is through a comprehensive and uniform regulatory framework. All actors in the online space should be subject to the same rules, and the federal government shouldn't favor one set of companies over another. Therefore, he has advocated returning to a technology-neutral privacy framework for the online world and harmonizing the FCC's privacy rules for broadband providers with the FTC's standards for others in the digital economy. Unfortunately, one of the previous administration's privacy rules that is scheduled to take effect on March 2 is not consistent with the FTC's privacy standards." Consumer advocacy groups have argued that the ISPs have a broader capacity to collect data on people than websites and digital services, given that ISPs connect users to all those websites and services in the first place. ISPs might use the collected data for their own promotions or sell it to data brokers for marketing or other uses. Pai's move on Friday seeks a vote of his fellow commissioners, of which there are currently two: a Democrat and a Republican. But even without the vote, the FCC staff can hit pause on the data security part of the rules until the full FCC vote on the pending petitions to reconsider the broader privacy rules.